TrackH! 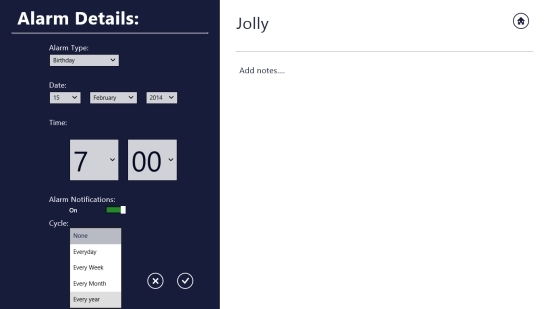 is a 3 in 1 Windows 8 app freely available in Windows Store that lets you easily set reminders, create To Do lists, and take quick notes. I have reviewed some individual reminder apps and notes apps recently but this one is certainly a perfect combo of useful tools to manage your everyday chores. This free Windows 8 app is a multipurpose app with very simple interface. You can create multiple reminders, task lists, and quick notes in the same app. You can also edit and delete these easily from the app. The app offers to set reminders for every day, every week, every month, or every year and get timely notifications for the same. You can create lists of your important to dos, and keep a track of the activities you have to do. You can also take quick notes and review them whenever required. TrackH! app is freely available under the Productivity category of Windows Store. You can also view it directly in Windows Store by clicking on the link given at the end. 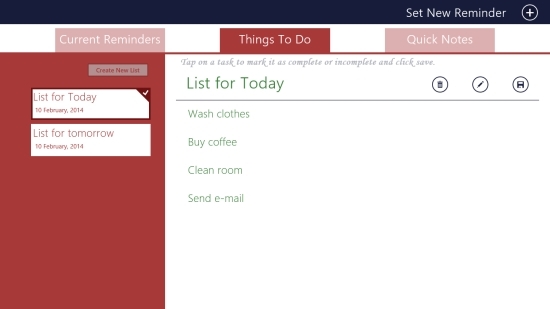 Let’s see how you can manage your day using this free Windows 8 app. To make use of this 3 in 1 Windows 8 app, just install it in your Windows 8 system. 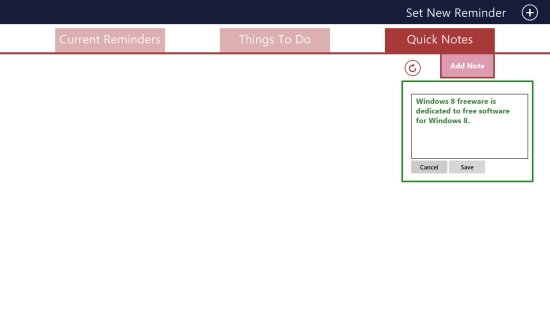 As you launch the app, you will see its Start screen with three tabs: Current Reminders, Things To Do, and Quick Notes . The option to Set New Reminder will be displayed on top right corner of the screen. To set a reminder, click on Set New Reminder. The next screen will show you Alarm Details on the left side. These include Alarm Type, Date, Time, and Notification. 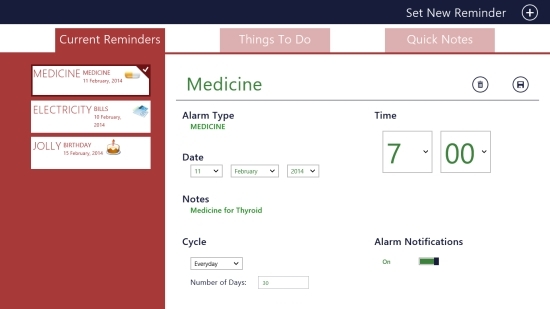 You to choose alarm type using the dropdown as Bills, Meeting, Call, Birthday, Anniversary, and Medicine reminder. Use the dropdowns again to set date and time of reminder. You can also set alarm notification by clicking on the option Notification. As you enable notification, a new option appears called Cycle. Using the dropdown, you can choose to receive notifications on everyday basis, weekly basis, monthly basis, or yearly basis. On the right side of the screen, enter Alarm Name. You can also add notes if needed. Once this is done, click on the right option given below the alarm details. You reminder is set successfully. You will also receive a confirmation regarding the same. You can set more reminders the same way. Your reminders list will be displayed on the Start screen of the app. To edit or delete a reminder, click on the desired reminder in the list to open details. You will find the icons to Delete Alarm and Save it again, if you have edited it. To create a to-do list, click on the second tab Things To Do. The next screen will show you the option Create New List, displayed on the top left side. Click on it to create a new task list. A window will appear in which you can write your task and click on Plus icon below it to add it to the task list. Your task will be displayed on the right side of the screen. Similarly add more tasks to your list. You can give a name to your list. Click on the right option given on top right corner of the screen to save your to do list in the app. You will receive a confirmation regarding the same. You can also mark a task as complete by doing a right click on that particular task in the task list. 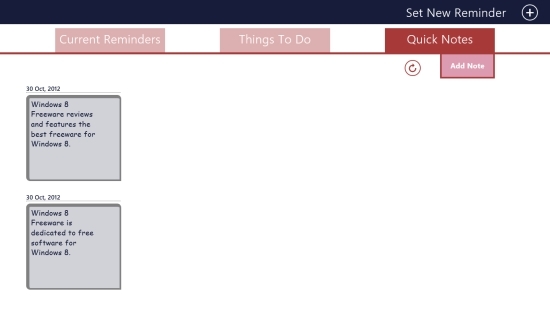 All your task lists will be displayed on the Start screen of the app by their names and date of creation. To edit or delete a particular task list, click on it to open details. The icons to Delete, Edit, and Save back the list will be displayed on top right corner. Click on the desired icon to process the operation. To create quick notes in the app, click on the third tab Quick Notes. Just below it, you will find an option to Add Note and a refresh icon. Click on Add Note to write a quick note. As you click on it, a text window will appear. Enter your text and click on Save button below it to save the note. You can take multiple quick notes in the same way. The notes list will be displayed on the app’s screen. You can click on a specific note to edit or delete it. TrackH! 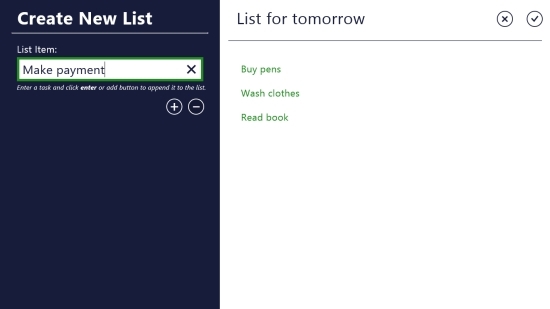 is a wonderful Windows 8 app that brings together three very useful tools to manage your daily chores. It is easy to use with a pleasing UI. Definitely a must try app.